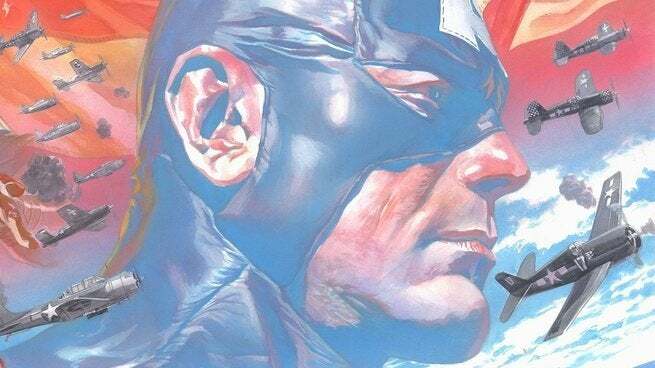 Captain America #1 stacks the deck against its titular hero. Every sequence introduces a new villain to be confronted and hints at a grander conspiracy, something on par with the original “Secret Empire” story. The real source of tension doesn’t stem from the return of a classic X-Men foe or a new brigade of Nuke soldiers though; it comes from a sense of doubt in the one man who isn’t supposed to possess any. There is a stress between the actions and words of Captain America in public and his thoughts in private. Recent events in the Marvel universe combined with a growing unease about choices made by his own government have left the hero feeling cast out even as he continues to play his role. It is a surprisingly melancholy issue, and one that slowly introduces readers to a conflict that defies easy summary. This holistic approach to the character makes the standard status quo recap of a first issue more palatable as each reintroduction and reminder serves a larger purpose. 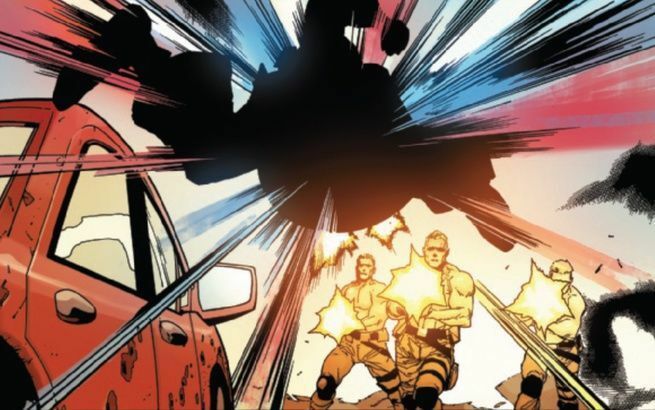 Bucky Barnes and Sharon Carter are posed as Steve Rogers’ closest allies and given new roles of their own. Thunderbolt Ross is returned to his classic role along with a variety of villains, many of whom now occupy surprising positions within the world. The pacing of all this is steady, pushed forward by action sequences that are more about the ideas and conflicts to come than the bullets flying on the National Mall or elsewhere. It serves the purpose of a handshake and initial words, providing you with a sense of what this meeting will be about without giving much away. The action still makes this relaxed pacing and tour of Captain America’s current existence a much improved read in the single issue format. Yu provides a back to basics approach, delivering consistent grids for all forms of storytelling with only an occasional splash offered to make a specific moment stand out. The result is that specific moments definitely stand out though with no risk of readers becoming distracted through a relentless series of cause and effect. Distances are emphasized to make the shield an impactful weapon and shifts in perspective often deliver as much information as explanatory dialogue. Yu’s characters remain distant force in many scenes. Eyes are reduced to slits and a lack of irises and pupils is especially distracting on a character like Captain America. In the first of two genuinely impressive splash pages, the character is distant instead of moving with these dual voids. The second shadows his face providing a much more stirring effect, but also one based on covering up a mismatch between tone and style. 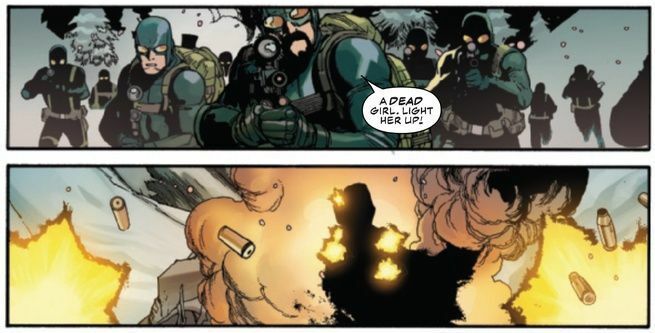 In spite of these momentary disconnects, Captain America #1 remains a very sincere introduction. It is a comic grappling with the nature of American identity in a moment filled with strife and unexpected challenges, along with a history that doesn’t lend itself to the discovery of easy answers or reassuring speeches. When Captain America tells someone it will be OK, he immediately undercuts himself in his own thoughts. This is a comic where courage can only exist alongside the fears that make it necessary. There is no thesis statement made in this issue. Like Captain America after a battle in Washington, it ends looking out on a world in chaos struggling to find answers. What one can certainly give Captain America #1 credit for is ambition. It tactfully addresses the greatest anxieties of the United States today and blends them into the zeitgeist of Marvel Comics. There is no heavy-handed speech made to address a struggle against hegemony, but that struggle is implicit throughout this foundation. It merges the tropes of the superhero with a thoughtful consideration of identity, both national and personal. That alone makes the future of this series exciting.